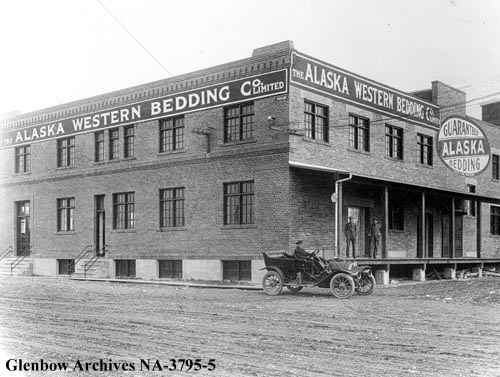 The historic Simmons mattress building along the river in East Village is to be the new HQ of the 'Calgary Municipal Land Corporation', according to David Parker in the April 13 and May 24 2007 Calgary Heralds. Info and photo below. The city-owned corporation is to be responsible for redevelopment in the East Village / Rivers District. http://www.calgary.ca/therivers. (He) expects to move into permanent space in the former Simmons Mattress building along 5th Avenue S.E. by August. Part of the 1,000 square feet of space will be devoted to a display area to keep the public and industry aware of the development's progress. Last edited by newsposter on Mon Mar 26, 2012 9:59 am, edited 5 times in total. New website for the Calgary Municipal Land Corporation, including information and images on the rehabilitation of the historic Simmons building for their offices. What year did it built? This building seems to have a great a history behind it. The Herald reported in January that "CMLC will this spring announce plans for the historic Simmons Building, which has been around for 100 years. There will be four uses for the building including retail as well as food and beverage." The CMLC offices will be moving into the Hillier Block, which is looking great with its renovations. There is an opportunity to visit the Simmons building for an open house on St. Patrick's Island plans on March 28. See the notice in Events.